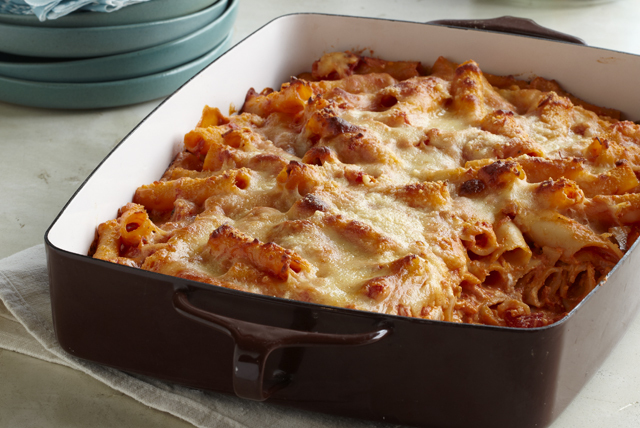 Enjoy our Best Baked Ziti Recipe, a creamy, cheesy baked ziti. Our Best Baked Ziti Recipe is made with better-for-you versions of sour cream & mozzarella. Cook pasta in large saucepan as directed on package, omitting salt. Remove from pan; drain. Meanwhile, cook pasta sauce, tomatoes and Neufchatel in same pan on medium heat 5 min. or until Neufchatel is completely melted and mixture is well blended, stirring frequently. Toss pasta with sauce; spread half onto bottom of 13x9-inch baking dish sprayed with cooking spray. Cover with layers of sour cream, 1 cup mozzarella and remaining pasta mixture; sprinkle with remaining mozzarella and Parmesan. Serve with smart sides, such as a hot steamed fresh vegetable and a crisp mixed green salad tossed with your favorite KRAFT Lite Dressing. Prepare with PHILADELPHIA Neufchatel Cheese, BREAKSTONE'S Reduced Fat or KNUDSEN Light Sour Cream, and KRAFT 2% Milk Shredded Mozzarella Cheese. The delicious pasta dish can be assembled ahead of time. Refrigerate up to 8 hours before baking as directed, increasing the baking time to 30 to 35 min. or until casserole is heated through.